Need help planning your wedding invitations? My expert advice can help you solve even the most difficult situations that arise as you are planning your wedding. Traditionally, the bride's parents host the wedding and their names appear on the host line. However, with blended families, couples marrying later in life and varying economic situations, the hosts may not be the bride's parents but a combination of hosts, so follow the circumstances that fit your situation. If the groom's parents are co-hosting your special day along with the bride's parents, it is customary for the bride's parent's names to appear first and the groom's parent's names follow. If the groom's parents are not co-hosting the wedding but the couple wishes to acknowledge them, their name appears after the groom's name. Titles are not spelled out, instead use the abbreviations for Mr. and Mrs., Ms. The title Doctor should not be abbreviated. The groom's complete name is used with his title, Mr., Doctor, Captain. In a situation where there is a divorce, the parent's names should appear on a separate line without the word "and." If the Mom is remarried use her married name. In years gone by, it wasn't proper etiquette to include a stepparent's name, however, if the bride or groom wishes, they may add their step parent's name. In cases where a parent is deceased and the bride or groom wants to include their name, they should make it clear that the person is deceased by including the word "late." An example of this wording is John Jones and the late Mary Jones. Omit titles as they would appear awkward. If the ceremony is being performed in a church, synagogue, mosque or any house of worship then the phrase "the honour of your presence" is used. 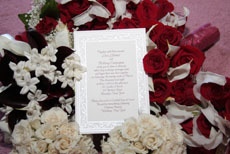 There are many variations of wording that are acceptable and proper for the couple to choose. 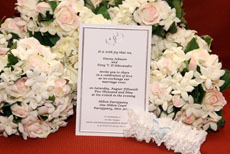 If you are inviting some guests only to the ceremony, then a separate reception card is necessary for proper etiquette. Some couples are choosing to have a scaled down party after the ceremony. This is perfectly acceptable however; wedding invitations etiquette says, it's courteous to inform your guests of such. You may phrase your invitation to read, "Cocktails to follow" in place of, "reception to follow." Couples wishing to have a reception with casual attire or a black tie affair should place that information on the reception card or on the lower right hand corner of the invite. Bridal registry information should not be placed anywhere on your invitation. Some unmarried guests may be insulted if they are not permitted to bring a guest, so be prepared with a stock answer. Something in the line of, "I'd love to have everyone bring a guest but it just isn't possible because ….. " and then give your reason. Perhaps your church or reception room is too small, or too costly, or "If I permit you to bring a guest then I will have to allow so and so to bring a guest and I simply don't have the budget to do as you wish." 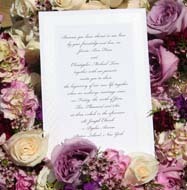 Hand written envelopes are a must; please do not use labels to address your invitations. You may hand write your own, have a friend help you or if your budget permits, hire a calligrapher to address the invitations. If a guest lives out of town or in another country and you would like to give them more time to respond, then send them a letter ahead of time. This way you won't have two sets of invitations going out giving your guests the impression that you have an "A" and "B" invite list. 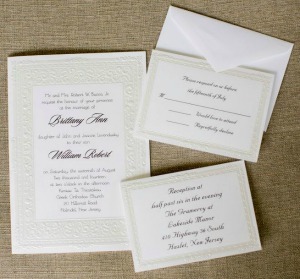 Wedding invitations etiquette is a little tricky so in addition to this page, you may wish to consult Martha Stewart's or Emily Post's web sites for further information. Take a look at my Tier 1 page for wonderful tips and ideas.